Disney is in another extremely strong age, following the Fairy Tale double-whammy of Tangled and Frozen with the wonderfully big-hearted Wreck-it Ralph and Big Hero 6. 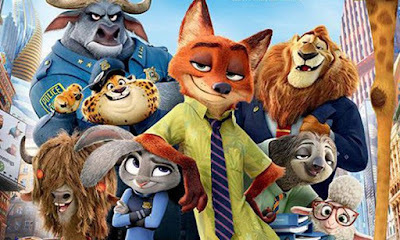 Now comes Zootopia, an animal allegory that holds a mirror up to human society in the time-honoured way, but with a clever and timely message that crucially seems to please everyone. Zootopia follows Judy Hopps the adorable anthropomorphic bunny as she follows her dream to become the first-ever rabbit police officer in the multicultural urban utopia that is Zootopia. Even though she manages to surprise everyone and make it through Police Academy as valedictorian, she is constantly underestimated until she manages to wrangle a simple investigation that soon unfurls into a conspiracy that will rock Hopps’ society to the core. But with her new odd-couple friend Nick Wilde the sly fox – and a coincidental powerful little ally – perhaps she has a shot at solving the mystery. This is of course a look at the current fixations the world has – diversity, integration, celebrating differences or fearing them, and comes with the refreshingly stark opening message that even if you’re told platitudes about following your dreams, it’s seldom that simple. Perhaps the cleverest part is that the messages offered by the film please opposite ends of the political spectrum. For the left, there’s the central message that if you have a dream you can follow it and defy the odds to buck the trend and win over all the doubters. For the right, there’s the concurrent message that there are fundamental differences between various groups, which come with innate limitations and strengths, and draw people into different roles based on averages – even if outliers can be encouraged. Everybody is happy. And using animals means that time-honoured jokes based on stereotypes can be gleefully employed – only about animals, so no human groups will be offended. The film is replete with sight gags based on appearance, comments about traits associated with different creatures and even jokes revolving around slurs. It’s quite nice that using animals circumvents the current problems about being ‘problematic’, or seeking to be entirely PC. Pace-wise this is a classic smooth committee-approved script, ticking off exposition, mystery, investigation, development, disillusion, revelation and final confrontation. It’s neither hard to predict nor new, but it works very nicely and hits all the right emotional notes. I wouldn’t say it has heart to the same degree as Wreck-It Ralph or Big Hero 6, but it absolutely gives the audience engaging characters, a fascinating and amusing world, a believable story, some hard-hitting moments and material for social debate, which is pretty good going for a children’s film. The ensemble cast is also very strong, with the likes of Idris Elba and Oscar winner J.K. Simmons having fun with broad roles, Maurice LeMarche doing a classic impersonation, Tommy Chong being Tommy Chong and Shakira rather bizarrely providing the emotional heart of the movie as well as a rather catchy Sia-penned closing number. I watched this movie late – I don’t think it will be showing in Japan much longer, and it’s months since its American release – but I’m glad I managed to catch it on the big screen. The way Zootopia is set up for creatures of all sizes and various climates is rather charming and the level of detail in every frame is astonishing. Another hit for Disney, and another set of characters I hope will soon be regarded as beloved characters from a classic film.